The Aeronca C-3 was an outgrowth of an earlier Aeronca Model, the C-2 Scout. It was inexpensive to own and operate (using only 3 gallons of fuel per hour) and became popular with sportsman pilots in its era. The passenger sat next to the pilot which made it convenient for teaching others how to fly. It was an easy-to-fly airplane with many first time students being able to fly “solo” after only five hours of instruction. The Aeronca C-3 was manufactured by the Aeronautical Corporation of America at Lunken Airport in Cincinnati, Ohio. The pilot sat so low in the cockpit (very close to the ground) which is thought to have given rise to the cliché of “Flying by the seat of your pants.” Of course, the fact that there was no airspeed indicator in the cockpit might also have had a lot to do with using that saying! Production of the C-3 began in 1931 and was halted in 1937, but not due to a drop in popularity of the airplane. The U.S. government standards for airplanes changed at that time and the C-3 did not meet those new standards. 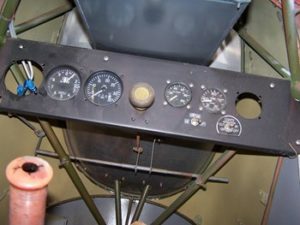 Such features as 3/32” cables support the wings, external wire bracing instead of strut bracing, fabric that was present right up to the engine firewall, a single ignition system on the engine and no airspeed indicator in the airplane suddenly made its production “illegal.” Fortunately for those who were C-3 owners they were “grandfathered” in by the federal regulations allowing their airplanes to continue flying, but no longer could the airplane be manufactured. Max gross weight 1006 pounds.